Microsoft changed thousands of things between Windows 7 and Windows 8. Not the least of the differences is the omission of Gadgets. Originally introduced in Windows Vista as the Sidebar, they were eventually reduced down to just individual gadgets in Windows 7, and taken out entirely in Windows 8. However, that’s not the end of the Windows Sidebar/Gadgets. With 8GadgetPack, you can bring them back to whatever OS you want, entirely free of worry. 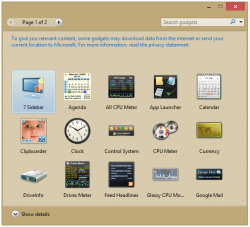 After you install the 8GadgetPack, you’ll be greeted with an all-new sidebar replica and the Windows Sidebar window, allowing you to pick and choose which widgets you want to have on your desktop. It actually seems to come with more gadgets than Windows 7 really did, so it’s virtually guaranteed that some of the gadgets are, in fact, illegal redistribution of some awesome original work. Since it’s hard to fish those out, you might as well simply end up using up all of the non-legitimate copies of the sidebars. Overall, 8GadgetPack’s back-to-the past gadgetting experience was both interesting and useful, as the added ability to have any random city’s weather and your system’s current CPU and RAM specs is both cool and interesting.